Hungry Howie’s has been around for over 45 years. We now have over 550 locations in 22 states across the US. We have built a brand known for inventing Flavored Crust® pizza and providing customers of all ages a high-quality product at a great value. Our customers are fans of flavor. A menu bursting with flavor and dough made fresh daily in each of our locations makes Hungry Howie’s different from the corporate pizza chains. Our family of independently owned and operated franchises are run by folks who live and work in your community. Adding a Flavored Crust® to your original round, deep dish, thin crust, or gluten-free crust brings flavor to your table at a fair price. Make sure to try our 8 free Flavored Crust® options – Butter, Asiago Cheese, Cajun, Butter Cheese, Sesame, Garlic Herb, Ranch, Onion – and of course don’t forget our Featured Flavored Crust®. We can’t live by pizza alone. So that’s why Hungry Howie’s offers a great selection of calzone-style oven-baked subs, Howie Bread®, fresh salads, Howie Wings®, Howie Rolls®, desserts & Pepsi® products. Every October, we turn our pizza boxes pink for our Love, Hope & Pizza campaign. Together with our customers and franchisees, we’ve raised over $2.5 million for the National Breast Cancer Foundation®. Learn more about Love, Hope & Pizza here. The Hungry Howie’s story began in 1973 when founder Jim Hearn converted a 1,000 square foot hamburger shop in Taylor, Michigan (a suburb just outside of Detroit) into a successful carry-out and delivery pizzeria. Steve Jackson delivered pizzas for Hearn. Later, the two partnered up to expand Hungry Howie’s and turn it into the brand it is today. In 1983, Jackson and Hearn awarded their first Hungry Howie’s franchise. 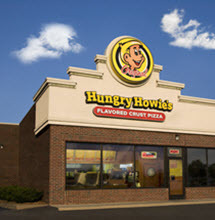 Within three years, Hungry Howie’s opened 65 franchises and by the end of the 1980s, we had over 160 units. We opened our 300th location in 1995, 400th in 1999 & 500th in 2005. In 2004, Hungry Howie’s was awarded “Chain of the Year” by Pizza Today magazine. The brand has emerged as a major competitor in the pizza marketplace and consistently ranks as one of the nation’s top pizza franchises. The direction of Hungry Howie’s changed forever when we developed and tested Flavored Crust® pizza regionally in 1983 and rolled it out nationally in 1985. we became the originator of the Flavored Crust® pizza by adding an exciting new dimension to one of America’s favorite foods.